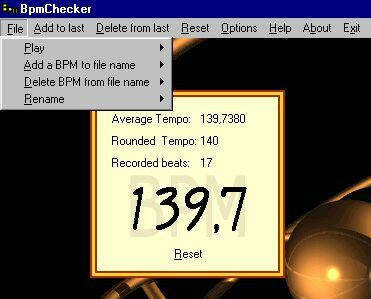 Determine the tempo or BPM of a song or other piece of music with BpmChecker by manually tapping along with the music, using your pc keyboard. Handy and cool tool for DJ's, composers and other musicians. Features automatic missed beat detection, playing of a music file through your own player and adding the bpm to (and removing from) the played file name or MP3 ID3v2 tag. The played song files are kept in a flexible history list. Nihil, pc able to run from Win95 onwards should suffy. Qweas is providing links to BpmChecker 4.0 as a courtesy, and makes no representations regarding BpmChecker or any other applications or any information related thereto. Any questions, complaints or claims regarding this application BpmChecker 4.0 must be directed to the appropriate software vendor. You may click the publisher link of BpmChecker on the top of this page to get more details about the vendor.